Forbush Corner: After yesterday’s fresh groom on the east side and good results for both the skate lane and classic tracks, Larry is headed out to groom the west side. About one inch of fresh snow that squeezed itself out of the clouds last night will also enhance the trail system. Hanson Hills: Skate Lanes are being groomed this morning. There are firm fast tracks set on all trails. XC Ski Headquarters: We received about a half inch of snow last night, and the Headquarters trails are in really good shape! Trail doctors Mike and Tony did a lot of snow spreading and some targeted trail doctoring this past week, which yielded fantastic results. Groomer Mike will snow comb the skating lanes this morning, and set fresh tracks on the Trappers Cabin trail. 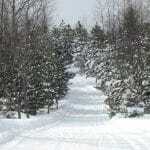 The best conditions are on the Rolling Hills, Trappers Cabin, Wild Turkey and Manitou trails. Many of the hard-packed spots were re-covered by snow doctoring efforts yesterday, so aside from bits of oak leaves and a couple remaining hard-packed spots under the big trees, it’s overall great skiing and should be enjoyed by many! This Morning/Today: We have some isolated lake effect this morning for areas North of M-72 in the Northern Lower Peninsula as well as North of M-28 in the Eastern U.P. The rest of us are seeing partly to mostly cloudy skies and temperatures are ranging from the mid teens to mid 20s. Winds are out of the West/Northwest at 5-10mph. Commutes should be ok but with this past weeks weather some back roads could still be very slick. Today will be mostly to partly sunny for the Central Lower Peninsula while the Northern Lower Peninsula and Eastern U.P. will see a chance for some lake effect snow. It won’t be very heavy or very widespread but some light snow will be out there today. Highs will range from 12 to 30 degrees with winds out of the North/Northwest at 5-15mph. The arctic air is moving in and with our winds today expect wind chills to feel more like -10 to 12 degrees by this evening. Tonight: We will see partly cloudy skies for the Eastern U.P. and some COLD temperatures while clouds and some light snow will keep the Lower Peninsula a bit warmer. Overnight lows will range from -13 to 13 degrees with winds out of the Northeast at 5-10mph. Wind chills will range from -20s to 5 degrees into tomorrow morning. Any snow will be light and only a skiff of snow is expected in some locations. This Weekend: Cold air settles into areas Saturday but for some in the Lower Peninsula we will see snow showers from a passing snow storm to our South. We will see an inch of snow for areas of the Northern Lower Peninsula while areas of the Central Lower Peninsula will see 1-3? of snow possible through the day. The Eastern U.P. will see cloudy skies. Highs Saturday will range from 5 to 23 degrees with wind chills feeling below zero to teens. Saturday night and Sunday morning will be mighty cold as overnight lows will range from -15 to 5 degrees as skies clear a bit. Sunday will be mostly to partly sunny with isolated lake effect snow. Highs will only range from 0 to 15 degrees! Keep yourself and pets safe in these conditions. Next Week: Monday morning will be the coldest yet with -20 to 0 degrees to start the day and with a little breeze it will feel more like -30 to -10 in spots at times. We will see mostly to partly sunny skies with isolated lake effect. Highs will be in the low teens to low 20s. We are watching a winter storm closely for Tuesday which will bring heavy snow and gusty winds. Highs will be in the mid 20s to mid 30s. Wednesday will start off with some snow in the morning but some sunshine in the afternoon and evening. Highs will be in the mid teens to mid 20s. Thursday is looking cloudy with a chance for some light snow in the afternoon and evening. Highs will be in the mid teens to mid 20s.